Jesus and the Canaanite Woman and Jesus and the Centurion are two similar encounters that teach us how to approach Jesus Christ in helplessness and faith. Please read Mark 7:24-30 before starting GraspingGod.com's free Bible study lessons, #2.15. Previous lesson: Jesus at the Well #2.14. 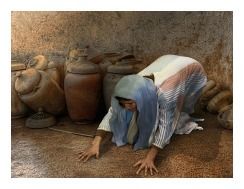 2) What was the topic between Jesus and the Canaanite woman? 3) Why was the conversation between Jesus and the centurion so short? 4) What is learned helplessness? Here is an astounding Bible truth for you: Salvation comes through the Jews, but open and free to everyone. Every ONE, that is, who realizes their physical and spiritual helplessness. Wow, did you know that before you read it? Great stuff today, thanks for coming by the Bible study. Please read Matthew 8:5-13, as well. Jesus Christ preached the Sermon on the Mount, which had people in awe of his authority. An aura of authority is earned by articulating expertise and confidence through your verbal communication. It is also earned through originality of content with new and logical ideas and solutions. This Jewish newcomer, Jesus, had everyone talking. Jesus was a reformer, in every sense of the word. Jesus Christ does possess authority from above, that which God granted him. He is the Messiah and King of Judaism, but also of the rest of the world. However, during this first ministry trip he had been seeking and ministering to the Jewish believers. Before we discuss Jesus and the Canaanite woman, let's first look at a similar situation that occurred between Jesus and the centurion. Jesus immediately began performing marvelous works after the Sermon on the Mount. He healed a leper, and then Jesus and the centurion struck up a conversation upon his arrival in Capernaum. 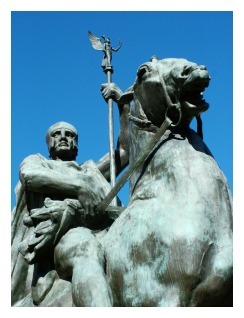 A centurion was a Roman commander, a Gentile, but his direct approach appealed to Jesus. The centurion asked if Jesus would heal his servant, who was a suffering paralytic. Despite the fact that Jews never entered the homes of Gentiles, Jesus immediately told the centurion he would follow him home and heal his servant. This was no small statement by the Christ, because he was beginning to break the barriers between God's chosen nation and the rest of the world (aka the Gentiles). The depth and wisdom of this man's response impressed Jesus. He had been struggling with the spiritual ignorance of the Jewish population for most of his adult life. 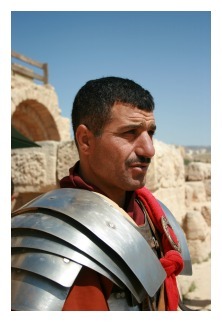 For Jesus to hear this Gentile soldier express his limitless faith in such a way was astonishing. Jesus and the centurion held a very short conversation because of one reason - the centurion's faith. Jesus, upon seeing and hearing the man's faithful response, immediately granted the man's wish and healed his servant from his present location. The centurion fully believed that Jesus had both the authority and power to do something which he himself could not do, that is, physically heal his servant. The centurion learned helplessness and then showed humility in accepting another's help. This show of faith ignited Jesus' compassion and he called on his authority to use his power to heal the servant. Remarkable! Sometime later, Jesus and the Canaanite woman had an encounter that was similar to Jesus and the centurion. Jesus Christ quietly entered the region of Tyre and was hoping to maintain a low profile, but, it was almost impossible. After word of his arrival spread, this one particular woman with a demon possessed daughter heard about Jesus. She approached him and worshiped him at his feet. She then begged him to cast the demon out of her daughter. Jesus ignored her for awhile and his disciples asked her to leave, but she persisted. 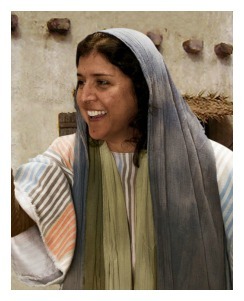 Jesus finally stopped and told her he was there to minister to the Jews and not the Gentiles. He said it in an interesting way, though, "First, I should feed the children - my own family, the Jews. It isn't right to take the food from the children and throw it to the dogs." You see, Jesus was figuratively stating that Israel has first rights to the Messiah, before anyone else gets to think about it. Israel was God's chosen nation and the Messiah came through the Hebrew nation. This was yet another remarkable statement from a witty and wise Gentile. She only wanted a crumb of the spiritual food Jesus was feeding Israel. Only a morsel. A leftover! Her answer floored Jesus. He was excited that she expressed such a great amount of faith in him. Why couldn't the Jews be as hungry as these Gentiles?! To reward the woman's faith, Jesus cast the demons out of the Canaanite woman's daughter. The story of Jesus and the Canaanite woman prove that God has compassion on those in need. The woman learned helplessness because she didn't have power over the demon who possessed her daughter. The demon was killing her poor daughter and she needed a Savior, albeit a physical Savior at that moment. Fortunately, the woman's spiritual faith in Jesus is what saved her daughter physically. Jesus loves to see a person express humble faith - he loves to use his authority and power to help those who are helpless, those who have learned helplessness. Faith in God is the results of a person learning physical and spiritual helplessness. They've humbled themselves enough to realize they need a Savior. When overpowered by spiritual forces they turn to the One who can deliver. When faced with physical hopelessness, they turn to the Healer. When faced with eternal death, they turn to the One who gives eternal life. The stories of Jesus and the Canaanite woman and Jesus and the centurion show us that we MUST understand learned helplessness. It involves grasping our human limitations, realizing we are in the hands of powerful spiritual forces, far beyond an ability to protect ourselves. We asked earlier, "What is humility?" A good definition of humility is "having a modest opinion or estimate of one's worth or importance." Christian humility is understanding that all we have and all we are comes from God. Humility results in gratitude, instead of pride. Humility praises God, instead of boasting in oneself. The key to becoming humble is to learn all you can about the God of the Bible and then comparing yourself to Jesus. 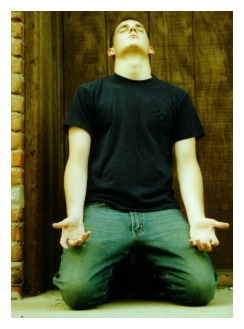 Believing Scriptures brings a person down low to his knees really quickly. Humility isn't belittling yourself in some type of self-deprecation, but it's exalting the Most High God. We're nothing but grasshoppers compared to God (Isaiah 40:22), but fortunately, God enjoys grasshoppers. Now, hop on board with God! Seriously, understand this mission critical element of salvation. Remember, God resists the proud, but helps the humble (James 4:6). Learned helplessness leads to humility, which leads to faith in God, which leads to eternal salvation! Salvation is your greatest need. I felt physical helplessness last year when an earthquake rumbled through the area - it was the first time in my life I'd felt an earthquake! I was humbled, to say the least! I thanked God for having already saved me. I also felt the same feeling while watching the 2011 Japanese Tsunami on the news. The power of the earth was so immense and the people were so helpless. It was sad. It's important understanding that God is so much more powerful than our world. Trusting him means we don't have to fear the harm that anyone or anything can do to us. Fearing God is the beginning of wisdom (Proverbs 1:7). Fearing God more than earthquakes, diseases, demons and anything else you can fear, sets you on the road to salvation. Fearing the God who can destroy your soul is much more important than fearing man, who can only destroy your body (Psalm 56:4). If the thought of God's wrath on judgment day somehow fails to make you tremble (James 2:19), you have an entirely wrong view of God. The times I realize my sin are the times I feel like God is going to reach down and squash me like a bug (Ephesians 5:6). God has that ability and every right to do such a thing. He hates sin and I know better. True faith leads to fear, which leads to wisdom, which leads to salvation. Whew! I'm out of breath! Total faith in the God of the Bible makes you tremble and makes you hate sin. That is wisdom. Loving God and hating sin is perfect wisdom, which leads to salvation (Ephesians 5:10-11). Salvation must be your ultimate goal in life. If it's not and your ultimate goal is less than that, you're self-deluded and deceived by Satan (2 Corinthians 4:4). You need to humble yourself, realize your critical errors and repent before God. You need to become a lover of the Bible. Cry out to God like King David (Psalm 119:25-32). 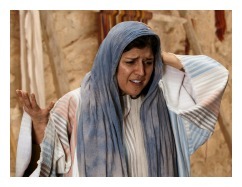 Both the Canaanite woman and the centurion learned helplessness in their unique situations. Fortunately, they both were granted faith by God to place in Jesus. Jesus was their true Messiah. Jesus, in order to glorify his Father in heaven, used his authority and power to heal the sick servant and cast the demon out of the girl. Faith led to action and action led to healing, but more importantly, to salvation through Christ. Jesus loves to hear someone cry out, "Help me, Jesus, help me!" That is the humble, faithful cry of human helplessness. That moment is when Jesus does his most awesome work. Stop trusting in yourself, your doctors, a comfortable lifestyle, or in whatever else you find your security. Jesus says it won't last - he's coming soon to burn it all up and call out your very soul (Luke 12:20-21). Are you ready? Cry out to Jesus Christ today. He's only after your best interests. He's calling you to take up your cross and follow him (Matthew 10:38). 1) What was the purpose(s) of miracles in Jesus' ministry? 2) What were some of the special attributes of the faith the centurion and Canaanite Woman expressed in Jesus? 3) How does helplessness lead to humility, and finally to faith in God? 4) Does Jesus always heal, or cast out demons, or other miracles when people cry out to him? Discuss your answer. After sharing this Bible study lesson on Facebook or Twitter below download your FREE printable Bible Study Lessons (pdf version): Jesus And The Canaanite Woman, Lesson 2.15. Special Note: I'm grateful to Big Book Media & Free Bible Images, Stock Exchange, Morgue Files, and Stock Photos For Free for the use of their photos for Jesus and the Canaanite Woman and Jesus and the Centurion Bible study lesson.